At 5:50 AM on the morning of September 29, 1918, the North Carolinians of the 30th Division—then serving under British command as part of the Fourth Army—emerged from the safety of their trenches and formed up in a single line, each man standing shoulder to shoulder, roughly four to six feet apart. In front of them, a slowly creeping Allied artillery barrage pounded the German lines, softening them for the infantry. Then, right down the line, the order to advance came. Their mission? To break the Hindenburg Line. The coordinated attack quickly descended into an assault of fragmented groups. Battlefield orders became way more difficult, if not impossible, to issue. Despite the chaos, the men continued their advance towards the enemy, dealing with the stress in whatever way they could. “[S]ome of the men were singing, some of them cussing,” recalled Surry County native John Collins, a member of Company A, 120th Infantry. Members of the 119th Infantry reached the Hindenburg Line ahead of schedule, leaving them stranded just in front of the enemy with their left flank exposed. Reinforcements from the 117th and 118th Infantry Regiments moved up in the afternoon to bolster their position but they remained more or less stalled. The men of the 120th experienced far better success, pushing the Germans from their trenches around 7:30 and becoming the first Allied troops to break the Hindenburg Line. Just two hours later, the 120th marched triumphantly into the French town of Bellicourt. But battlefield successes did not come without great sacrifice. Walking the field in the wake of the assault, Col. Joseph Hyde Pratt, of Chapel Hill, was struck by the grim realities of war. 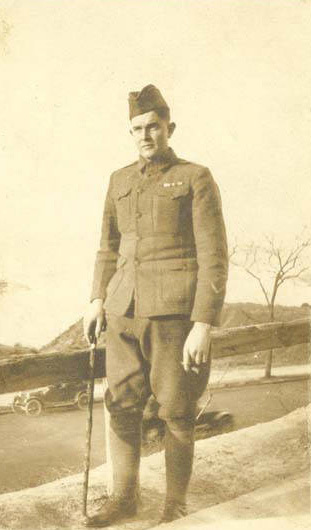 “It was a hard experience to see our men lying dead on the field,” he wrote in his diary the next day, “and while it was expected, it did not ease the pain it caused me.” In fact, in analyzing the records of our state’s dead, we now know that the September 29, 1918, charge on the Hindenburg Line was North Carolina’s deadliest of the war.